As the clouds break into a cool drizzle, breaking the monotony and bringing with them much-needed relief from the humidity, houseboats idle in the silent waters of criss-crossing canals, bordered by graceful palms. Seen on travel brochures alongside the ubiquitous 'god's own country' logo, the backwaters of southern Kerala really know how to work their charm. A confluence of Aryan and Dravidian cultures, this coastal land is home to traditional performing arts and the medicinal science of ayurveda. This lovechild of nature and culture is emerging as a favourite with India's business travellers who are happy to bond with colleagues and discuss business strategies against this calm backgdrop. Essentially a cluster of islands, dispersed around one of India's largest lakes, the Vembanad, Kumarakominvites you to be part of the perfect backwater experience. The lake connects dense mangrove forests, paddy fields and palms, painting a picture that mirrors the merging of blue and green on an artist's palette. Situated amidst this picturepostcard setting is the popular restreat, Zuri Resort and Spa. 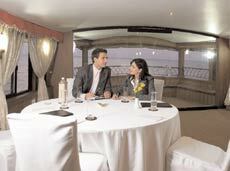 The house boats make fascinating venues for business meetings. Sprawled over 18 acres, the resort is a cluster of cosy rooms, cottages and pool villas. You can also enjoy live entertainment zones, restaurants and bars. It is, in essence, a bunch of claytiled slooped roofs, typical of the region, surrounded by manicured greens and connected by a path. These well-spaced clusters are embraced by the lake on its periphery and a manmade brackish lagoon at the core, designed so that all rooms overlook the water. Fabricating a work space within a lazy landscape isn't the easiest thing to do, but Zuri surprises you with its not-so-stuffy work zones. Embellished with Dravidian murals and wooden carvings offset by colourful chandeliers and wicker fans, the banquet hall is an ode to Kerala's vibrant art and craft. Housing up to 175 people, the hall is kitted out with all the right equipment and creates a space that's conducive to conducting business. If you wish to take the offsite experience to a whole new level, you can have your get-togethers on a houseboat cruise through the Vembanad. Revel in Kumarakom's scenic beauty while at work, or indulge in fresh sea food and relaxing head and foot massages after sunset. There's also a live band on board that performs soft jazz numbers and belts out country music that reverberates soothingly in the calm and quiet backwaters. Since business trips are usually time-constrained, the hotel aims to acquaint guests with the distinctive elements of its local culture. Kerala's traditional dance-drama, kathakali, conveys epic traditions through striking facial expressions concealed by paint. This is performed in its most classic form, along with the local martial art of kalarippayattu. Adding a recreational spin to your date with Malabari culture, are the canoe races, palm reading sessions and fun pottery classes. The Park Nestled on the shores of the Vembanad lake, it features plush rooms and an on-shore entertainment deck, Vallom, which comes alive every evening with dance-drama and martial art performances. A good business offsite is one that offers a break from the monotony of everyday, especially from the countless etiquettes and protocols the corporate world seems to thrive on. Granting this unspoken wish, Zuri organises business lunches where guests are urged to don classic Kerala attire; the womencan wear white and gold cotton saris and the men, kurtas and white mundus (wrap arounds). They can also ditch the fork and knife and savour a traditional sadhya lunch with their hands. Conventionally served only on Onam, this feast consists of an assortment of pickles, curries, vegetables and puffed paddy, placed in a certain order on a fresh banana leaf. Zuri's Maya spa offers innovative international and traditional ayurvedic treatments. At the sea food restaurant Laguna Bass and 24-hour coffeeshop Lime Tree, guests can indulge in local delicacies like freshly sourced kareemeen or tapioca mixed with fish curry, Calicut halwa and the coconut based local liqueur, toddy. Those looking for a break from daily work-related stress and irregular sleep patterns can also enjoy a specially planned menu here. Executive chef Narayan Rao says, "We make an extra effort to customise the cuisine in a way that meets the requirements of each guest. Be it by tempering spices and herbs or cooking in the guest's preferred oil, it can all be done." The Malabar coast is home to Ayurveda's panchakarma discourse which centres on detoxification. 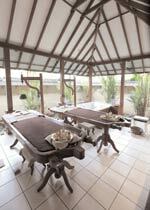 Zuri's Maya Spa combines this with western treatments in its various stress management packages. Lying back in the plushly upholstered massage bed, with a crisp cotton sheet drawn over and a slow drip of oil dotting the forehead at precisely-timed intervals, the shirodhara is one of the most popular treatments here and has a deeply calming effect. Besides the usual Kerala treatments, you can tread the Balinese path with acupressure and gentle stretches that ease muscle knots. The most striking treatment on the menu though is something called Cloud 9 which begins with a Swedish massage and is followed by a quick nap on the Italian floatation bed, Nuvola. It is believed that a 20-minute nap on this bed is as relaxing as two hours of deep sleep on a regular bed. Fact or myth, most people who visit the spa are curious enough to take a shot at this quirky variant of power napping. The yoga and meditation classes held at gazebos on land strips that enter the lagoon, help channelise your thoughts and energies. You could also get charged up for the day with an early morning trek to the Vembanad bird sanctuary, where you are likely to spot exotic migratory birds like the Malabar pied hornbill and the brahminy kite. In his famous short story, Lagoon, Joseph Conrad uses the stillness of a lagoon as a backdrop for bringing out human emotions. As if estranged from the sea, the silent waters of the Vembanad lake unravel and evoke hidden emotions, and afford you an attribute often lost to the compulsions and expectations of today's hectic work lives -introspection. So, come to Kumarakom's backwaters with a purpose and go back with many more.